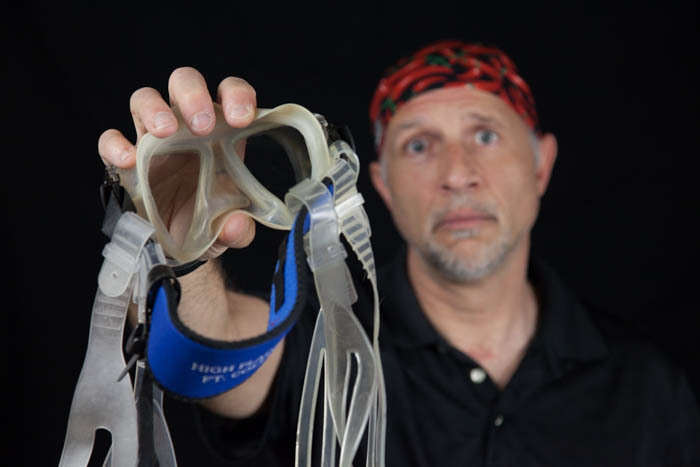 Have you ever considered how you would respond if your mask strap broke underwater while you were diving? As SCUBA divers one of the skills that we are taught is to remove and replace a mask underwater and I’ve shared stories about this in earlier posts. Being prepared to handle a problem during a SCUBA dive is obviously important. Taking care of your gear before your trip or on the surface can prevent the problem entirely – which is even better! Rubber mask straps should be free from tears. Once a tear begins it is very easy for it to get worse or fail. Make sure the strap retainers are in place to keep the extra strap from interfering with your field of vision. Check the buckles on the mask itself to make sure there are no cracked or broken components. Velcro (or Velcro-like product) masks or “Slap Straps” should be checked to make sure the two sides (hook and loop) are still able to stick together firmly without slipping. What else do you check on your mask strap before you dive? Oh… and check out the ridiculous photo out-takes here!